I would like to keep at least one candle burning on my altar either all the time or in between spells, but am not sure what kind to use or how it should be dressed. Is there a Hoodoo tradition for this? i dont know about tradition, but you could try making a lamp and use different oil combinations to keep it. I'm working on a love/marriage lamp for my wife and I right now that will always be lit, but others burn constant lights for a peaceful home, money, luck, protection, etc. Other than this type of perpetual work, I don't believe there is precedent for a light "just because". The candle cops aren't going to break down your door if you do, but if you want a light going all the time, why not have it work for you? CowboyInTheBoatofRa wrote: I would like to keep at least one candle burning on my altar either all the time or in between spells, but am not sure what kind to use or how it should be dressed. Is there a Hoodoo tradition for this? Working and praying without ceasing has ample precedent in hoodoo. I regard perpetual flames (whether candles or lamps) as worthy and effective means of working, particularly for conditions and situations that are chronic in nature. From my own experience, for a span of almost 3 years, I had at least one candle burning for myself at all times--I would dress the next candle in the series and light it just before the old candle finished. I varied the specific dressing and focus of each candle according to what was going on in my life at the time. Do take adequate precautions for fire safety if you decide to pursue this method. J Simulcik wrote: I'm working on a love/marriage lamp for my wife and I right now that will always be lit, but others burn constant lights for a peaceful home, money, luck, protection, etc. Other than this type of perpetual work, I don't believe there is precedent for a light "just because". The candle cops aren't going to break down your door if you do, but if you want a light going all the time, why not have it work for you? I do this, as does most of my family! All the candles are seven day glass enclosed ones. I continously burn a white protection candle, a green St. Anthony candle, and a gold Enfant of Prague candle. I have three candles going continously and I never had a problem. Funny story, my mother had a break in about ten years ago (she left her bedroom window open) and she was very lucky since she was in the house at the time. The police came in when she was gone and never bothered her candle (she burns one) and never even mentioned the candle to her. When I went into the house after they were done dusting for fingerprints, the candle was fine. If you feel a little nervous about having a candle burning, you can always put them in a metal pain with some water in the bathtub. I know a worker who did that for years. I also have glass encased vigil lights burning all the time. When no one is at home they go into the kitchen sink or the sink in the bathroom. Many of my lights are for clients, but like Mary, I do have lights burning constantly for myself, my husband, and our family. Thanks, Everybody. This is very helpful. I do have a question though. As someone who is new to this work, I'm not sure what people are talking about when they say they are making a lamp. What is this? "A money lamp is a regular glass-reservoir kerosene lamp which you have prepared by placing a Money Drawing mineral -- either a chunk of pyrite, like the one shown above, or a lodestone dressed with magnetic sands -- and a bunch of coins in the reservoir where they can be seen. The coins can either all be silver dimes, or the change you took in during your first cash sales, or an assortment of one penny, one nickel, one dime, one quarter, one fifty-cent piece, and one silver dollar -- that is, one each of every denomination of coin. Use green-tinted lamp oil in the lamp (most hardware stores carry tinted lamp oil.)" A love lamp like J describes is similar, but set for love as opposed to money. My wife and I put together a love lamp for strengthening our marriage and keeping the love strong. Some visitors to the forum may not be familiar with lamps for work, and they say a picture is worth 1,000 words, so I'll attach a photo as well. We put it in our main area on a low bookshelf with other photos and symbols of our relationship that we've collected over the years, and it stays lit all the time. Nice work! I expect you usually have a chimney on it, to keep it from smoking, right? Here's a photo of the money lamp in the Lucky Mojo shop. It contains Lodestone, Pyrite, and many coins. Oh, they are both so pretty, I've always been enamored with old style oil lamps. I've been considering making one for to help attract a lasting love but am kinda paranoid about fire. I keep thinking the oil will spill and somehow catch ablaze or the whole lamp will explode. irrational I know but the idea of a uncontrolled fire or something my odd little brain thinks will cause one sacres me to death. Thanks for the compliments! The chimney's just out of frame to the left; I took the picture while waiting for the wick to soak up the oil. As the Bible says in Psalm 119:105: "Your word is a lamp to my feet and a light to my path." 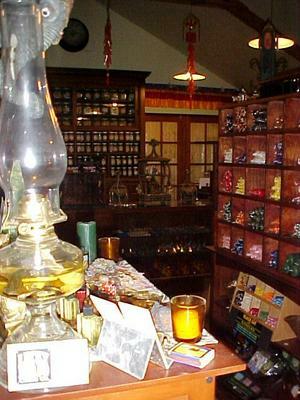 Oil lamps such as you are asking about have a history of being used for magic, prayer, petition, and spell casting, especially within the traditions of the African Diaspora, ceremonial Magick, and Jewish Mysticism. In hoodoo and conjure practice a lamp such as this is normally a regular glass-reservoir kerosene lamp which has been fixed by adding minerals, herbs, roots, zoological curios, powders, and oils into the lamp's reservoir and then covering them with lamp fuel. Aha! Now i see the chimney! For those who wish to experiment with oil lamps in a tiny, symbolic way, we sell miniature (dollhouse) 4" tall oil lamps in brown (court case), blue (peaceful home, health, serenity), and green (money drawing) glass. They come fixed with tiny curios inside, but no kerosene (too dangerous to ship -- buy it at any hardware outlet). And, alas, no, the company that makes these does not sell red glass ones. They actually do work, and can be burned, although the reservoir is small and they will not stay lit a long time. We made a bulk purchase of them to donate as giveaways during an oil lamp class at the MISC Hoodoo Workshops, and that is why we offer them for sale in the shop. Read more about money drawing oil lamps at the Lucky Mojo website. cat, those tiny lamps are seriously cute! The green lamp can be used for any kind of money work. More items can be added to the lamps, correct? I'm working on building up my money altar and the lamps look fantastic! If you have a standard oil lamp with a large reservoir, you can petty much keep it going perpetually. You remove and clean the chimney daily and replace it. When the lamp runs low on fuel, you top it up again: you lift off the chimney, then unscrew the burner and lift it off, keeping the wick still in the fuel, and you pour more kerosene in without blowing the wick out. Then you screw the burner down again, replace the chimney, and keep going. Remember, though, while using oil lamps, that you must trim your wicks to avoid excess smokey soot, and even when the wick is well-trimmed, you should clean and shine the chimney daily for spiritual reasons. Sharona22 wrote: Are there any lamps which aid in your connection to pyschic development,dreams,spirit guides etc. The most common lamps that I have run across are for love or money, but I don't see why you could not make a psychic development lamp. You would go about it in much the same way that you would make a love or money lamp--choosing colors, oils, and curios that are appropriate for the condition you are trying to increase. If I were doing a Psychic development lamp I would use a blue lamp, or a clear lamp with blue lamp oil. I would add some Psychic vision oil to the resevoir, I would add approrpriate herbs like anise, and I would add curios too. I would treat this lamp like a "light unto my path" praying that it would give me claritty and depth in my intuition and psychic vision. Its not the most traditional way to use a lamp, but I think it could be done. One charm that I would add to such a lamp that has a special place in my heart and, it seems, in Miss Cat's is the Eye of Agamotto. Oh sure, it was associated with Buddha first, but when I think of scrying, I think of ol' Aggy. You will have an issue if the lamp won't fit something 1.5" into the reservoir, but many lamps have indented bottoms where this might be placed and sealed underneath. I agree with Bri that this may not be as traditional a use for a lamp as love or money, but I think somebody had to have tried lamps for other conditions before! wow. fantastic. how long will these tiny lamps stay lit? hey Bri your idea are wonderful,hope you do not mind me useing um, I should use curios in odd numbers? is there any specific number associated with pyschic developement or clarity? Do they sell basic blue or clear lamps at LM if not where do you get them?The oil in reservoir. Info on eye of Agamotto please? They sell blue oil lamps at LuckyMojo but they are fixed for peace and healing. Check any hardware outlet for lamps and tinted lamp oil. Yes, they are the same. On one hand is the actual amulet, while on the other is the Agamotto Eye, a popular culture appropriation of it. So interesting that you asked because an excellent presentation by Professor Charles Porterfield was delivered at the Hoodoo Workshop weekend on this exact subject! I had learned about oil lamps long ago as a student of cat's, and had been interested in them then, but never got around to fixing one up. Then I got inspired and part of the workshop was a hands-on portion where we each received a little oil lamp and fixed it for a specific purpose. I can report that I was so pleased with the initial and continual results that I went out and got two more large lamps which I will be fixing for myself and clients! As far as fixing the lamp, I think of lamps as a hybrid between a container spell and a candle spell. You fill the well of the lamp with appropriate items, herbs, curios, roots, etc. You fix up your petition which you can put in the well itself, tape to the bottom of the lamp, or even affix to the submerged part of the wick (if you make it very small) and then you add lamp oil and colorant if you wish. Soap dye works to color lamp oil. Thank you so much for your reply! I have some large lamps, and I also have some mini ones from childhood. I may experiment with the small ones first. I had read the info on the site about them but didn't have a clear image in my head of how best to use them. I'll be experimenting over the next couple of days now! Thank you so much! Burning a lamp for multiple people? I'm trying to burn a lamp for multiple people and it was suggested that writing out a petition would make the spell stronger. If I want to burn one lamp for multiple people, should I write them all out each on a separate petition? Or on the same one? Re: Burning a lamp for multiple people? I have money and love lamps burning for clients and for myself. My permanent petition is inside of the lamp and then the petitions for everyone else sit under the lamp. I see on the website that LM sells money drawing, peaceful home and court case oil lamps. Do you sell love oil lamps? Sorry, but we do not. These are little mini-lamps, and we use them mostly for demonstration purposes in our workshops, and they only come in those three colours. They are quite cute and nice, though. and look up Prof. Porterfield in the list of rootworkers along the left side of your browser screen, you will see that he makes and prepares beautiful full-sized oil lamps for all purposes. I just received my money drawing lamp from LM...it is so cute...I almost afraid to use it feeling it may melt. Anyway...what are some suggestions for spellwork using this lamp during the waning moon? I was looking for the money drawing lamp on the lm website to order and I could not find it. Can you post a link? jwmcclin wrote: I just received my money drawing lamp from LM...it is so cute...I almost afraid to use it feeling it may melt. Anyway...what are some suggestions for spellwork using this lamp during the waning moon? If this is going to be your primary money lamp then I would wait until the moon starts waxing if you can. If not, fix the lamp on a Thursday or a Friday, preferably in the planetary hour ruled by Jupiter (I am addressing specific timing because you brought it up in your post). You can fill the lamp well with roots, herbs, and a curio or two that serve to draw and keep money, kerosene oil, and a little drop or two of a money drawing, wealth drawing condition oil, like Money Drawing or Wealthy Way. Pray over the lamp, tell it what you are going to work with it to achieve and light it up! The cute little thing that hold all of that? I can wait until the waxing moon...hopefully, prayerfully, Thanks Bri, I will follow your advice...also the lamp is fixed. I'm attempting to do an oil lamp for one of my spirits. This magical work is to attract someone towards me who is a long distance away. How do I know if it is working? I mean besides confirmation from that spirit... What are some tips or experiences people have from working with oil lamps? I am happy to report that the LM shop in Forestville does now sell oil lamps (both big and small). I had never thought/heard of oil lamp dressing but it makes sense and is a beautiful presentation. 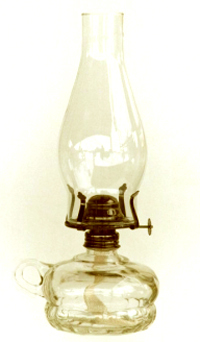 I hope to work with oil lamps in the near future. 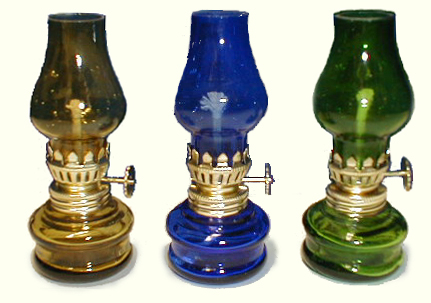 Has anyone had good/bad experiences with oil lamp work? Look for signs -- odd occurances involving the nams of those on whoe behalf you are working, stange events in the antural world, dreams, etc. You can also use Bibliomancy to open the Bible at random and read the portion you are given. Not sure what kind of oil it came filled with (because I didn't make it, and haven't been able to reach the creator) but I'm pretty sure it's clear "lamp oil." As the oil burned down and needed replenshing, that is what I bought from the hardware store. It smells fumey too. Does anyone know if I can mix in Ultra Pure parrafin oil instead? I know from glass candle lamps I own that the paraffin oil burns clean, no soot, no fumes. -I don't want to disrupt the good money mojo. Does lamp oil have a magical quality that's needed? -Also, I don't know if it's okay to mix paraffin oil with lamp oil. Couldn't find that info on the internet. -Since the lamp is blessed and filled with roots, charms, etc, it doesn't seem possible to empty the old oil and change it. Anyone know about this? Thanks! I know exactly the lamp you are talking about and it is gorgeous. You should be able to mix the clear parrafin oil in with whatever you have right now (probably kerosene). Even the Ultra pure parrafin is a little fumey but most likely less so. Thanks so much, Bri! I'll let this burn as low as I can and try adding Ultra pure next refill. And yes, it's SO gorgeous. Charles rocked it out! I just started the oil lamp last night and this particular lamp is a 7 day lamp. Do i just light it for 7 days or do I need to say a prayer to that particular spirit for those 7 days whenever i light it. Generally you keep your oil lamp burning continuously - or as continuously as you can. So you would burn it, and then refill the oil before it burned out. It's a way to continuously keep heat on a petition, but can be more cost effective than burning vigil candle after vigil candle. i cant really burn it continuously since im not always at the house. But the oil lamp work im going by says to relight it for 7 days. Then follow those directions. Say whatever you want over it that states your petition. I would spend a little time with it everyday. I just set my lamp in a deep sink or the tub when I'm not home. I don't extinguish lamps or vigil lights ever - lamps, if I'm going out of town, but otherwise not. ok now i have a problem... the wicks i got for the oil lamp were floating wicks i found at a Jewish online supply store. Last night, the wick went out, the wicks are only like 1 cm long each. I thought that it looked short, but didn't question it. But i have a box of 50 of those floating wicks, so I tried to relight it just now and after about a minute, it sizzled and then went out. Oh, you're using THAT kind of oil lamp. I'm only familiar with the hurricane kerosine type lamps - I've never worked with the floating wick kinds - except at very short intervals for Hindu puja. Hopefully someone else with more experience with that kind of lamp can address your problem. Actually I'm not sure what to do... every time i put a new wick in the oil lamp, it goes out quickly and i looked up on another website said that those are not meant to last long, only long enough for a single prayer. So, I'm not sure if i need to start over? I'm gonna get a regular wick, but i don't want to throw out the contents of the lamp, should i save it and then just start over? I have two oil lamps going right now, supposed to be constantly. They are mini lamps- a bit larger than the ones sold here - about 10 inches tall, each holds a few ounces of paraffin - what I am burning- along with herbs, personal concerns, and LM oils. One is for money/prosperity and one is to support my relationship. Both aspects of my life are a bit rocky right now. I have found that each of these lamps burns at wildly different rates, leading to at least weekly unexpected burn-outs. Some times the oil reservoir is enough to burn for two whole days. Sometimes it burns out completely overnight in a matter of 6 or 8 hours. At times I know what this is about- for example my lover and I are having communication problems -particularly pronounced last night. I made sure to fill the lamp before sleeping, and woke up 6 hours later to find it out and bone dry. I have not been doing much particularly focused work at these altars as of late, simply saying a psalms or prayer over them as I refill the oil- I check in the morning and before bed; sometimes I will leave one of the talismans or crystals I have been working with at the altar overnight. Several times the lamps have somehow gained my attention at just the last minute, allowing me just enough time to either fill them just before they go out or sometimes to rush into the room just to see the last spark of flame die. So I have a few questions: Is a fast burn of an oil lamp similar to a fast burning candle? What is the magical/spiritual significance of a lamp burning out unexpectedly? What is the best practice for re-lighting a lamp that has burned out this way? Is there a method, saint, or product that I could add to my lamp work to avoid burn-outs and assist in the work in general? The fast burn of a lamp is similar to the fast burn of a candle, yes. Most of the same signs that apply to candle work apply to lamp work. Are you taking spiritual baths in addition to working the lamps? Have you spiritually cleaned your home? Doing both of these things will greatly assist your work and make your concentration stronger. i have my oil lamp or candles in my altar while i'm at home , but when i have to go out i set up in my bathtup, is that ok?